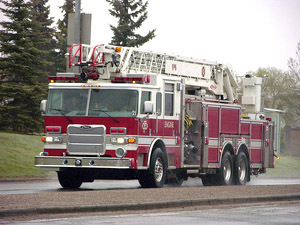 24-hour, seven day a week fire protection for Calgary businesses. ULC approved fire alarm and security monitoring services. Our customer monitoring centres are inspected and listed by Underwriters Laboratories of Canada (ULC) and offer 24 hour, seven day a week protection. ULC approval assures: professional staffing, safeguarded facilities, computer assisted reporting, complete documentation of system activities and testing. Is your building subject to any special fire codes or requirements? Have you experienced water damage to a faulty system? Is your sprinkler system working properly? Installed, tested, and maintained by qualified Certified Alarms tech. Many insurance companies grant discounts for a fire and sprinkler system monitored by ULC listed companies. A sprinkler system that malfunctions can release many gallons of water into a building causing a great deal of damage. Our monitoring system minimizes damage. The Critical Equipment Monitoring System is more reliable and cost-effective than using people to observe critical functions. Your business could suffer if an important piece of equipment such as a freezer, boiler, air conditioner or compressor breaks down. The system’s capacity to locate the origin of an alarm allows corrective measures to be taken at the first service call. In many communities, fire authorities require commercial and public premises to be equipped with fire alarm systems. You can be directed to a Monitoring Centre which dispatches help, on a 24-hour basis / 365 days a year. A sprinkler system will retard the spread of flames until the fire department arrives. However, if accidentally activated, the same sprinkler system will cause damage by releasing water into the building. The sprinkler monitoring system avoids this kind of disaster. In the event of a sprinkler malfunction, the Certified Alarms Customer Monitoring Station notifies the appropriate authorities before extensive damage is done. We monitor key zones of you sprinkler system to ensure that it is ready to work when required by making sure valves remain open and ciritical parts stay in working order. We can also monitor waterflow, water pressure, power loss, and temperature. Certified Alarms alerts you before malfunctioning equipment can disrupt your business. Our full range of sensors detect abnormal temperature, pressure, power, fluid flow and liquid levels. In case of trouble, Certfied Alarms’ Monitoring Station notfies you of the problem so appropriate action can be take. c) the listed fire alarm monitoring company.